I haven’t been posting much of late, especially with my Wishing Wednesday series as I haven’t had much desire to shop. Well, ZARA is having their semi-annual sale and I didn’t buy a single item! That should tell you how bad it is as I almost never resist ZARA on sale. Yet, surprisingly here I am holding up my self-restraint with all the crazy sales going on. I guess having to spend for my wedding has turned me off from wanting to shop and add to that an impending move, which means wanting to par down belongings instead of adding more. I digress however, as I have been thinking about this ASOS Wiggle Dress in Border Wallpaper, patiently awaiting for it to go on sale. While I am not generally a big fan of prints, let alone clashing prints, there is something about this dress that draws my attention. The complimentary colors of the clashing prints makes the dress less revolting, if I dare say so. Whatever it is, it has captured my attention and the fact that it has pockets? I’m sold! Besides, I don’t have any dresses in that style, a boat neck dress with sleeves and pencil skirt silhouette. The longer hemline is also a plus in my books as I prefer my clothes to be work appropriate since I spend a third of my weekdays at work. Well, since I won a $50 American Express gift card from work last week, I’ve been pondering on what to spend it on. Since I haven’t been wanting much, I even thought about just being practical and using it for groceries! (sounds so crazy, right? ;)) Fret not, for I finally decided to pull the trigger today since ASOS is having a 20% off full items sale in conjunction with July 4th (Use HAPPYFOURTH for the discount). Now, to wait for the pretty dress to arrive. I promise to do a review when it arrives! 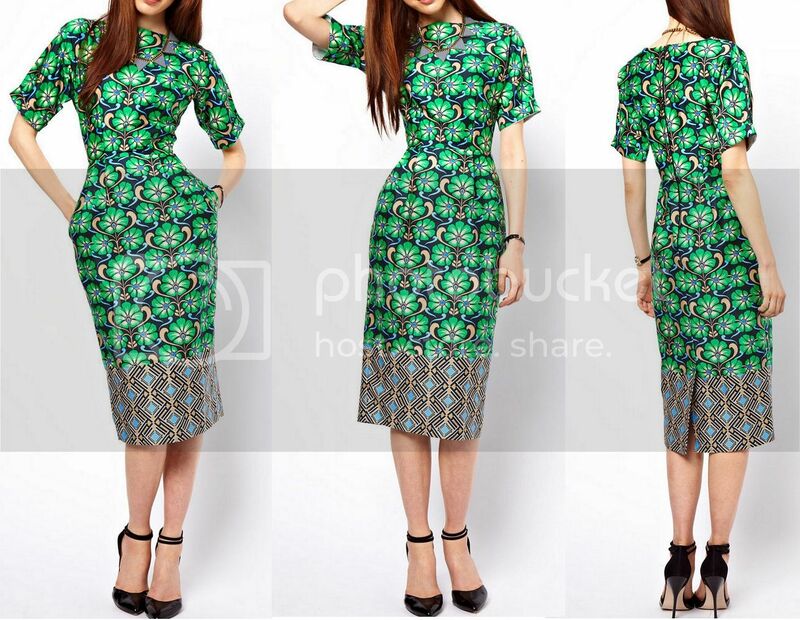 This entry was posted in Fashion, Shopping and tagged ASOS, dress, green, print on July 3, 2013 by fauxionista. Going green on a Wednesday for some pick-me-up! Happy Hump Day! This entry was posted in Fashion, Outfit and tagged black, Forever 21, gold, green, H&M, Little Stam, Marc Jacobs, Merona, Michael Kors, milk, Resort 2007, Tangs Studio on August 15, 2012 by fauxionista.